In my view the human Reward System is one of the most relevant (brain) structures that control human behavior. It is composed of brain structures and neural pathways that are responsible for associative learning like classical conditioning and operant reinforcement, incentive salience (motivation, desire, or craving for a reward), and positive emotions. 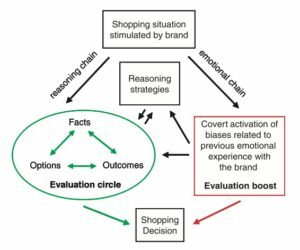 In a study published in 2005, – as far as I know the first fMRI study on cerebral brand processing – we investigated how individual economic decisions are influenced by brand stimuli on neural level. The interdependence of emotions and body states and their important impact on behavior was realized already in the 19th century by the American philosopher and psychologist William James. 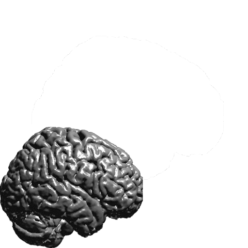 A system-level neuroanatomical and cognitive framework for the influence of emotions on decision making has been proposed by Antonio R. Damasio in his somatic marker hypothesis. The central idea of this hypothesis is that decision-making is a process influenced by marker signals arising in (somatic) bioregulatory processes, especially those underlying emotions. We found for products mainly distinguishable by brand information that a first-choice brand (FCB) induced changes with reduced cortical activity within areas associated with rule, strategy, and memory processing, on one hand, and increased activity of structures storing and processing emotional experience of a stimulus, on the other hand. The FCB-specific increase in cortical activation in the medial prefrontal cortex can be interpreted as the fMRI correlate of brain activations involved in the emotional chain (see Figure 1, right), that is, the integration of previous emotional experience with a brand into the ongoing decision process. In combination with the reduced activations in regions associated with reasoning strategies (reasoning chain, Figure 1, left), our results, which can be interpreted according to the framework of Damasio, supported the hypothesis that in the competitive situation of buying decisions, only a FCB has the specific power to switch between the two cortical processing chains whereas (even!) a second-rated brand already cannot. For more details see Deppe et al. 2005. This mechanism may explain the price premium derived from successful brands. The important finding of our study was not that a favorite brand distinctively activates the reward system – this was assumed – but that all second-rated brands failed to do this in all of our examined subjects. Based on these results, I hypothesize that the secret of a successful brand is quite simple: Considering that humans are willing to pay for (positive) emotions but second- or lower-rated brands simply evoke none (latter was demonstrated by our study! ), a successful brand must be a FCB in as many consumer brains as possible. Other factors like a high position in relevant set, level of awareness, or familiarity on their own are worthless in sense of a relevant price premium related to other brands. A typical examples for a FCB is Coca Cola®, while Pepsi Cola® is second-rated in many subjects. Repple, J., Meinert, S., Grotegerd, D., Kugel, H., Redlich, R., Dohm, K., Zaremba, D., Opel, N., Buerger, C., Forster, K., Nick, T., Arolt, V., Heindel, W., Deppe, M., Dannlowski, U., 2017. A voxel-based diffusion tensor imaging study in unipolar and bipolar depression. Bipolar Disord. Dannlowski, U., Grabe, H.J., Wittfeld, K., Klaus, J., Konrad, C., Grotegerd, D., Redlich, R., Suslow, T., Opel, N., Ohrmann, P., Bauer, J., Zwanzger, P., Laeger, I., Hohoff, C., Arolt, V., Heindel, W., Deppe, M., Domschke, K., Hegenscheid, K., Volzke, H., Stacey, D., Meyer Zu, S.H., Kugel, H., Baune, B.T., 2015. Multimodal imaging of a tescalcin (TESC)-regulating polymorphism (rs7294919)-specific effects on hippocampal gray matter structure. Mol.Psychiatry 20, 398-404. Plassmann, H., Kenning, P., Deppe, M., Kugel, H., Schwindt, W., 2008. How choice ambiguity modulates activity in brain areas representing brand preference: evidence from consumer neuroscience. J Consumer Behav 7, 360-367. Deppe, M., Schwindt, W., Pieper, A., Kugel, H., Plassmann, H., Kenning, P., Deppe, K., Ringelstein, E.B., 2007. Anterior cingulate reflects susceptibility to framing during attractiveness evaluation. Neuroreport 18, 1119-1123. Deppe, M., Schwindt, W., Kugel, H., Plassmann, H., Kenning, P., 2005. Nonlinear responses within the medial prefrontal cortex reveal when specific implicit information influences economic decision making. J.Neuroimaging 15, 171-182. Deppe, M., Schwindt, W., Kramer, J., Kugel, H., Plassmann, H., Kenning, P., Ringelstein, E.B., 2005. Evidence for a neural correlate of a framing effect: bias-specific activity in the ventromedial prefrontal cortex during credibility judgments. Brain Res.Bull. 67, 413-421.